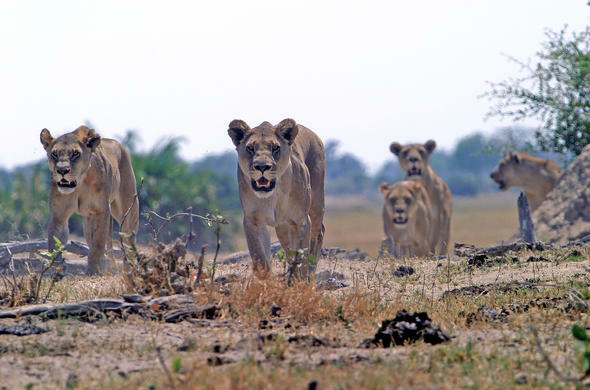 Join us on a journey into the Linyanti Wildlife Reserve in Botswana. These Linyanti safari tours offers you the opportunity to indulge in an unforgettable game lodge stay, and a safari experience with professional safari guides. Your two hour flight from Johannesburg or Cape Town will land you in Maun, for your charter flight into Linyanti. The Linyanti region is formed by the Kwando River rising in the highlands of Angola, and flowing through Zambia and the Caprivi Strip of Namibia before becoming the Linyanti River. Here it forms an Okavango-type wetland along the border of Namibia and Botswana. This focal point attracts seasonal game that migrate to the River during dry winter months as well as diverse bird species. This pristine wilderness situated north of the Okavango, and fed by the Kwando River, is home to one of Botswana's large Elephant populations, especially during the dry season, from May to October when waterholes dry out and animals congregate in large numbers closer to the river. Various activities provide you with the full African experience within the Linyanti eco-system. These optional activities include amazing sunset or sunrise cruises, morning or evening game drives and bush walks with abundant game viewing making for an unforgettable African experience. Linyanti will leave you with experiences that will last a lifetime. Highlights include meandering through waterways and riverine forests, walking across the vast dry woodlands and open grasslands, and unforgettable game viewing experiences. These "painted" hunting dogs are the high-light of any Linyanti safari because of their rarity. Botswana holds 50% of the worlds Wild Dog population, and is one of just four African countries where Wild Dogs still exist.